The Rose and Crown may have its name changed to The Huntsman if owners, Marston, get their way. 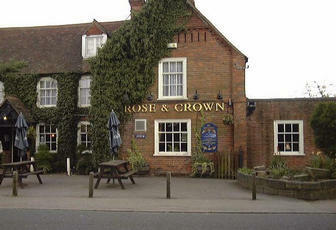 The name Rose and Crown has been in use since at least 1787 and was recorded in the Survey by Thomas Richardson of the Whitley Ridge and Lady Cross Walks of the Forest. The next preceding record before this which I am aware of in for 1770 in the Forest Rental lists. Here it is recorded as the Three Crowns. The earliest reference of this name is the fuelwood list for 1725. From 1725 the occupier was a member of the Collis family and they continued in occupation into the second half of the 19th century. They first appear in the Brockenhurst Parish Registers in 1718, John the first known landlord died in 1754, aged 63, and is buried in the Churchyard He was from a Worcestershire family of good standing. Before the property came to be known as the Three Crowns it was called Rookley’s messuage, a name derived from Robert Rookley Head, Forester of the South Bailiwick, who died in about 1544. The 1670 Claim for Forest Rights by William Knapton (Lord of the Manor of Brockenhurst) records the property as Rockely’s messuage. Another corrupt version of the name, Brookley’s, is recorded in the sale by Philip Cray to Edward Morant in 1772. Cray was the Lord of the Manor of Brockenhurst, while Morant’s family went on to become Lords of the Manor. The name is of special interest in the Village, [and] is intertwined with Village history and within the village only St Nicholas Church and Ash Cottage significantly pre-date it. [The ] NFA contends that the proposal to remove the lettering Rose and Crown from the front of the building will have a significant impact upon the character and appearance of the listed building as one of special architectural and historic interest. It is surprising that a new business venture should start by alienating the village and regular visitors, and NFA respectfully ask the applicant to withdraw and reconsider. A mere name change may seem like a standard practice, a re-branding trotted out in the business model of a chain of interchangeable concerns. But, in the New Forest, our heritage is written in the names of our woodland inclosures, our villages, and even our humble pubs. Thanks to Graham Baker and Richard Reeves for their work shared here. Error: Error validating access token: Session has expired on Sunday, 10-Mar-19 01:16:56 PST. The current time is Wednesday, 24-Apr-19 23:01:18 PDT.